What is Deva Vegan Glucosamine MSM & CMO? Deva Vegan Glucosamine MSM & CMO is a joint supplement manufactured by Deva Nutrition, a supplement company that specializes in vegan supplements. 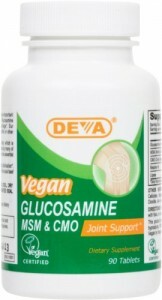 Deva Vegan Glucosamine MSM & CMO is the best offering we’ve found for vegan joint sufferers. It has 3/9 ingredients we look for in a joint supplement. It has CMO which makes it stand out from other non-vegan joint products. We found no artificial dyes or coloring in Deva Vegan Glucosamine. 1.5 stars out of 5. Deva Vegan Glucosamine MSM & CMO is the best supplement for vegetarian and vegan arthritis sufferers. Glucosamine Has 1500mg of a vegetarian glucosamine hydrochloride. Glucosamine is a precursor to glycosaminoglycans which are a major component of joint cartilage. Cetyl Myristoleate (CMO) Has 100mg of cetyl myristoleate complex which includes other cetylated fatty acids. Cetyl myristoleate is a compound found in the joints of arthritis-resistant mice. What is the best shellfish free joint and bone supplement? What is the best shell fish free bone and joint supplement?